Over my spring break last week, I started reading Archbishop Oscar Romero: A Disciple Who Revealed the Glory of God by Damian Zynda. I’d been meaning to read it since I had heard her interviewed on Creighton’s Catholic Comments podcast (a podcast I highly recommend). One of the recurring themes in the text is the question of conversion, and Zynda frequently returns to the quote above, written by Romero in one of his spiritual notebooks (8). Although I haven’t finished the book yet, I wanted to highlight what I think is a really important contribution the text makes for people interested in the life of Romero. 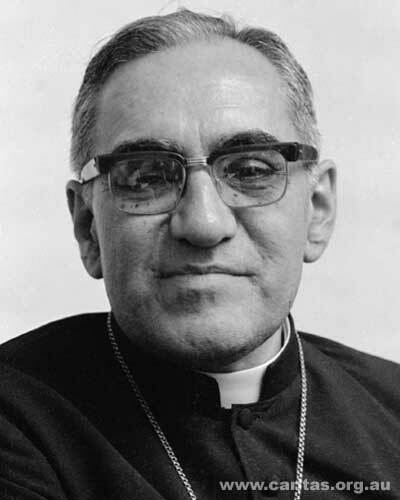 The narrative most people are familiar with when it comes to Romero is that he had been a fairly conservative priest (later bishop) in El Salvador. In 1977 he was appointed Archbishop of San Salvador. Later that year, the assassination of his close friend Rutilio Grande sparked a dramatic conversion experience, after which Romero became increasingly dedicated to the poor, suffering, and politically/economically marginalized of his country. This ultimately led to his own assassination while presiding over mass on March 24th, 1980. Zynda’s book does two important things that are not as effectively highlighted by other works I’ve seen on Romero. First, it offers a really compelling theological framework for thinking about Romero’s conversion. Zynda’s second chapter looks at the theology of Irenaeus of Lyon (ca. 130-200 CE). Irenaeus’ most famous quote is (depending on translation) ”The glory of God is the human being fully alive.” As you can imagine from Zynda’s subtitle, she sees Romero as one who became fully alive. Conversion occurs in the tension between God drawing us ever more deeply into the divine life and our ongoing attempts to respond to that gift of grace. Indeed, Zynda emphasizes that conversion is a “developmental process” that occurs “little by little or abruptly” and that “stimulated change within continuity. We never actually change our underlying personality structure; we are converted within its continuity” (75). Understanding Romero’s conversion then relies on Zynda’s second great contribution, which involves taking stock of Romero’s struggle with obsessive compulsive personality disorder (OCPD). Romero was diagnosed with OCPD in 1966 at age 49, although Zynda notes that evidence of OCPD behaviors can be found earlier in his life in the lists and agenda that Romero wrote in his journals. Zynda further ties this to Romero’s own sense of moral scrupulosity, the high standard of which he not only held for other priests and religious, but especially for himself (9). In the years following his diagnosis, Romero initially tried to control his OCPD through new strategies, but he eventually came to recognize the role his family background had on his personality (22). Most significantly, Romero came to understand that “clinical psychology [was] a supplement to theology and morality to define and explain his personality disorder and its consequences” (23). He came to view his OCPD as an integral part of his experience of being human. The key to tying these together is twofold. One, this narrative of Romero’s life highlights the profound importance that psychoanalysis can have in one’s spiritual life. There are a lot of unhelpful ways of linking spirituality and mental illness, and there have been numerous efforts to anachronistically psychoanalyze theologians like Augustine. With Romero, there is I think a very profound story of someone undergoing more modern forms of therapy and finding it immensely fruitful in the spiritual life. Two, I think it’s really helpful to see Romero’s conversion as more complicated and more in continuity than it is sometimes portrayed. I don’t mean here to downplay Romero’s well-known conservativism (including his opposition to the Medellin document), but rather to point out that the workings of the Spirit that led to his close identification with the poor and oppressed of El Salvador was not solely or exclusively the result of one abrupt event. Rather, Romero had been undergoing a long path of conversion that featured slow, subtle shifts alongside the dramatic ones. To return to the quote at top, Romero allowed himself to be possessed more and more by God, sometimes cautiously, sometimes, slowly, and sometimes in great leaps. To be converted to the human being fully alive, to display the glory of God, took the whole of his lifetime, and it took the whole circumstances of his life. He was a martyr who ought to be remembered in all the concrete specifics of his human existence, including his struggle with mental illness, because it was in this concrete life that he was converted. I’d recommend the book to anyone interested in Romero or anyone interested in the intersections between spirituality and mental health. I haven’t finished reading the book yet and I’ve only sketched some of its argument, but I’ve been very moved by it so far. Go here to see some of my favorite quotes from Archbishop Romero. Stephen thank you for this post! And I will have to read the book (and thanks for the podcast suggestion too!). I wonder if what you are saying could even make more sense if we consider the other part of that quote by Ignatius of Lyon. In one of my early posts on this blog — https://dailytheology.org/2011/10/21/matthew-2016/ — I pointed out how that quote about God’s glory is a human being fully alive was written with a corollary. That the two should go together and should not be separated. I did that by citing Maggie Ross who is doing work on recovering the loss biblical word “behold”. The whole line from Ignatius is “The glory of God is the human being fully alive; and the glory of the human being the beholding of God.” The two go together. In your discussion of slow conversion over time is about beholding. Entering that space of prayer where we drop away our will to do something or to be something and to hold God in being AND AT THE SAME TIME be held in being by God. It is active receptivity that comes from a space of contemplation….and it is out of that space that we slowly are converted and allow for God to come through our everyday life and to be more fully alive. This makes the most sense that Romero who was more and more open to justice and the poor in the world did so from a space of prayer and liturgy. In lots of “not doing” — the seeds are planted for action in the world. This aligns with Pope Francis’ call to Encounter with Christ (Jesuit contemplation resulting in action as seen in the 4th week of the exercises), as well as various forms of Christian prayer and action (Francis, Benedict, etc, etc) throughout the entire tradition. I mention this because it is VERY important to stress the moment of not doing in a culture of doing and achieving; to stress communal liturgical and prayer work in a culture of individualism; important to point to grace in a culture of work, etc. Holding both aspects of the Ignatius of Lyon quote together drives your very good point of conversion home even more. Again, thanks for a good post!